Big Brother arrows feather HS1314. Embroidered White Cotton Bathroom Hand Towel. Design is approx. 4" x3" Hand towel 16" X 26". Material: PEVA. Magnets keep liner in place. 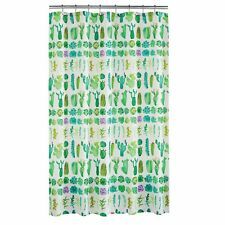 Lightweight Shower Liner - Color : White. Boxer Dog Silhouette w Red Bandana HS1070. Embroidered White Cotton Bathroom Hand Towel. Design is approx. 3.5" x 4" Hand Towel 16" x 25". Cat face with blue eyes H1332. Embroidered White 100% Cotton Bathroom Hand Towel. Design is approx. 4" x 3" Hand Towel 16" x 26" Cloth 12" x 12". Cat face with green eyes H1333. Embroidered White 100% Cotton Bathroom Hand Towel. Design is approx. 4" x 3" Hand Towel 16" x 26" Cloth 12" x 12". Aloha Vibes -w Hibiscus Flower HS1320. Embroidered White 100% Cotton Bathroom Hand Towel. Design is approx. 4" x 4" Hand Towel 16" x 26". Shrimp Boat Captain - Shrimper occupation HS1319. Embroidered White 100% Cotton Bathroom Hand Towel. Design is approx. 3" x 3" Hand Towel 16" x 26". Nautical saying- Whatever floats your boat HS1318. Embroidered White 100% Cotton Bathroom Hand Towel. Design is approx. 3" x 4" Hand Towel 16" x 26". Embroidered White 100% Cotton Bathroom Hand Towel. Design is approx. 4" x 3" Hand Towel 16" x 26". I EMBROIDER THEM, AND I HAVE SEVERAL OTHER DESIGNS. ZEBRA FACE, EMBROIDERED DESIGN, WHITE HAND TOWEL. EMBROIDERY STABILIZER, WHICH IS NECESSARY FOR MACHINE EMBROIDERY. 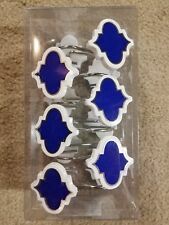 THESE MAKE A VERY UNIQUE & PRACTICAL GIFT, USE THESE LIKE YOUR NORMAL TOWELS. Skull w Pink Flowers and Swirls HS0731. Embroidered White Bathroom Hand Towel. Design is approx. 4" x 2.5" Hand Towel 16" x 26". Pistol #1 with Light Pink Grip HS0692. Embroidered White 100% Cotton Bathroom Hand Towel. SILVER HAND GUN PISTOL Revolver with Brown Grip HS0648. Handmade Embroidered White Colored 100% Cotton Hand Towel. Colorful Seahorse HS0762. Embroidered White 100% Cotton Bathroom Hand Towel-. Design is approx. 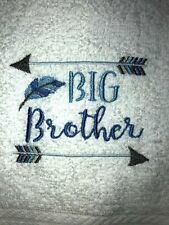 3" x 4" Hand Towel approx. Sea turtle in sea waves teal colors used HS1111. Handmade Embroidered White 100 Cotton Bathroom Hand Towel. Design is approx. 4" x 4" Hand Towel 16" x 26". Little Girl Monkey in tutu Swinging from branch HS0458. 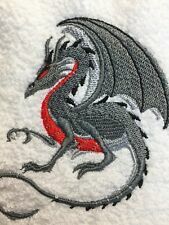 Embroidered White Bathroom Hand Towel. Design is approx. 3" x 4" Hand Towel 16" x 26". Mary Kay Inspired H0134. Embroidered White Cotton Hand Towel and Wash Cloth Set. Embroidered White 100% Cotton Bathroom Hand Towel -. Design is approx. Hs0290 BLOODY HANDPRINT. Embroidered White Bathroom Hand Towel. Design is approx. 2.5" x 4" Hand Towel 16" x 26". Tan Tabby Cat with in wash tub with socks and ducky- bathing cat HS1240. 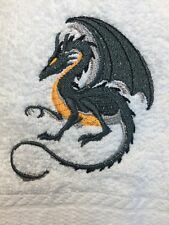 Embroidered White Bathroom Hand Towel. Design is approx. 4" x 4" Hand Towel 16" x 26". Embroidered White 100% Cotton Bathroom Hand Towel. Ocean- Starfish in Brown Background of seashells. Embroidered White 100% Cotton Bathroom Hand Towel. Design is approx. 2.5" x 2.5" Hand Towel 16" x 26". Comic Book Hero Saying- Super Hero- CRASH! Embroidered White Cotton Bathroom Hand Towel. Design is approx. 4" x 3" Hand Towel 16" x 26". HS1054 IN GREENS AND PURPLE COLORS. FLOURISH ALPHABET MONOGRAM LETTER H.
"SMOKIN DOOBIES - MARIJUANA "- HS0633. Handmade Embroidered White 100% Cotton Bathroom Hand Towel. Design is approx. 3.5" x 3" Hand Towel 16" x 26". You are my sunshine. HS1040. Embroidered White Cotton Bathroom Hand Towel. Design is approx. 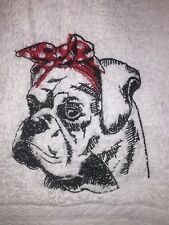 4" x 4" Hand Towel 16" x 25". 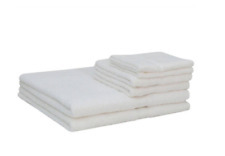 Embroidered White 100% Cotton Hand Towel and Wash Cloth Set. Design is approx. 4" x 2" Hand Towel 16" x 26" Cloth 12" x 12". Embroidered White Bathroom Hand Towel. Design is approx. 2.5" x 4" Hand Towel 16" x 26". HS1269 Trailer Sweet Trailer RV Camping. Embroidered White Bathroom Hand Towel. Design is approx. 4" x 3" Hand Towel 16" x 26". Gray Tabby Cat with shower cap and towel with slippers HS1247. Embroidered White Bathroom Hand Towel. Design is approx. 4" x 4" Hand Towel 16" x 26". Embroidered White Bathroom Hand towel. Design is approx. 2.5" x 4" Towel 16" x 26". 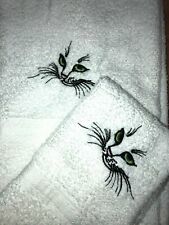 Embroidered White 100% Cotton Bathroom Hand Towel. Design is approx. 4" x 4" Hand Towel 16" x 26". Embroidered White 100% Cotton Bathroom Hand Towel. Design is approx. 3" x 3" Hand Towel 16" x 26". COLORFUL BUTTERFLY HS0341. 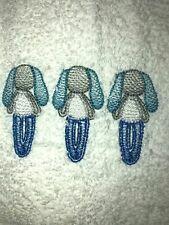 Embroidered 100% Cotton Kitchen or Bathroom Hand Towel. Design is approx. 4" x 4" Hand Towel 16" x 26". Embroidered White 100% Cotton Bathroom Hand Towel. Design is approx. 3.5" x 4" Hand Towel 16" x 26". Embroidered White Bathroom Hand Towel. Design is approx. 3"x 4" across Hand Towel is 16" x 26". Embroidered White 100% Cotton Hand Towel and Wash Cloth Set-. Vet Tech with dog and Cat and Red Cross- Animal Rescue HS0774. Embroidered White 100% Cotton Bathroom Hand Towel. Design is approx. 4" x 2" Hand Towel 16" x 26". Appliqued Green Gingham Patterned Frog w Ribbit! on Cloth H1309. Appliqued Embroidered 100% Cotton Bathroom Hand Towel and Cloth Set. Design is approx. 3.5" x 4" Hand Towel 16" x 26" Cloth 12" x 12". Cute dragon in flowers H1329. Embroidered White Bathroom Hand Towel and Cloth Set. Design is approx. 4" x 4" Hand Towel 16" x 26"Cloth 12" x 12". Embroidered Handmade 100% Cotton White Bathroom Hand Towel and Wash Cloth Set. Embroidered White Cotton Bathroom Hand Towel. Design is approx. 3.5" X 2" Hand Towel 16" x 26". Add this snowglobe lotion pump to your bathroom decor. Because it's made of ceramic, it's easy to clean. 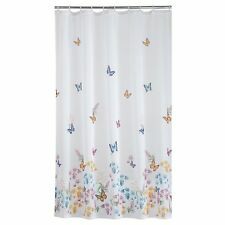 Embroidered White 100% Cotton Mainstays bathroom Hand Towel. Design is approx. 4" x 3.5" Hand Towel 16" x 26". Hot Pink Flamingo Doodle HS0767. Embroidered White 100% Cotton Bathroom Hand Towel. Design is approx. 3" x 4" Hand towel 16" x 26". Sea You at the Beach w Shell HS0927. Embroidered Bathroom Hand Towel (White). Design is approx. 3.5" x 3" Hand Towel 16" x 26".